Stir, stir the witches' brew; stir, stir, and stir they will all throughout November! Welcome this month in the company of Sloto’s own crew of witches that will come up with winning potions just for you when you deposit $35 min. 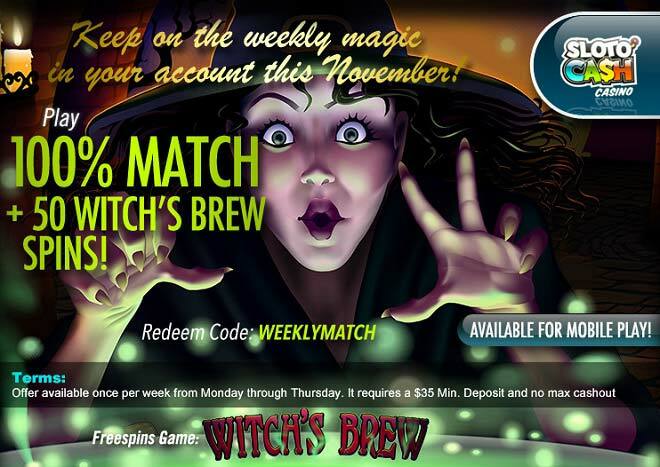 once per week from Monday through Thursday to play with a 100% Match + 50 Witch’s Brew Spins! The spookiest time of the year is still going strong and you can join in the festivities when you spin the 5 reels and 25 paylines of Witch’s Brew – a world where you’ll be in the company of Dragon's Fang, Goblin Blood, Spellbooks, the Witch, Warlock and many more spooky images. Help Sloto’s witches keep the fire hot so that the cauldron bubbles with wins just for you once per week this November! 100% Match + 50 Witch’s Brew Spins!